Veneers are of two kinds. Porcelain veneers and composite veneers. Porcelain veneer is a thin tooth coloured shell made from porcelain material. Composite veneer is a thin layer of white composite resin material placed on the teeth. Dental veneer material generally gets placed over the tooth surface by the dentist in Geelong to change the shape, colour and position of the tooth. It can also improve the aesthetics of a tooth and can also protect damaged tooth surface. Dentists at our Dental Clinic in Geelong can make teeth veneers in the following situations. Teeth veneers when made using composite resins. The dentist has to clean and prepare the tooth. Composite resin are then placed onto the cleaned tooth during your first dental appointment at our dental clinic in Geelong. The Dentist will shape the resins according to the patients tooth and the resin will be set using a special curing light. These placements of the composite resins are done in increments by the dentist. Composite resins are then polished by the dentist using diamond burs and polishing cups. Composite resins are also simple cost effective dental veneer solution with the dentist in Geelong. The disadvantage of composite dental veneer is, it can discolour and also chip. Porcelain dental veneers require two dental appointments with the dentists at our dental clinic in Geelong. Veneer has to be fabricated by a dental technician in a dental laboratory. Porcelain dental veneer are more durable and less likely to stain than veneer made by composite resin and they look more natural like your teeth. All porcelain veneer are fabricated individually for each patient. Porcelain Veneer may need minimal preparation with the dentist when fabricated by a dental technician in a dental laboratory. The dentist at our dental clinic in Geelong will cement the porcelain veneer onto the tooth. Dental veneer are not a permanent solution. They may chip or debond. Dental veneer are used when the natural teeth needs to be preserved. Porcelain veneers placement consists of two dental appointments at our dental clinic in Geelong. The initial dental veneer appointment with dentist in Geelong can involve dental x-rays being taken to make sure the teeth and the surroundings are healthy. Impressions of upper and lower teeth are also taken. The Impressions are taken by the dentist using rubber based material and sent to a local dental lab in Geelong or Melbourne. The colour is selected by the patient with the dentist in consultation. If a colour can’t be compromised. Then the patient can go to the dental lab and discuss further options with the dental technician. The dentist will show the finished veneer. The dental veneer are tried with special glue. Patient can visually see how they are going to look with new veneer. The veneer is then removed and cleaned. The teeth are also cleaned using a special agent. Then it is washed and dried for the dental veneer to be stuck with permanent cement. Regular visits to the dentist in Geelong and a good oral hygiene will help dental veneers to last for a prolonged periods of time. The patient is given a night guard to wear to protect the teeth veneer. This can prevent any grinding or chipping of the teeth veneer. 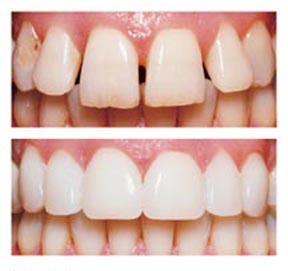 If you need any cosmetic dental treatment like veneers in Geelong. Please call our dental clinic in Geelong to book your dental Veneer appointment. Speak to one of our qualified cosmetic dentist doing dental veneers in Geelong.